USA Network's, “Unsolved: The Murders of Tupac and The Notorious B.I.G. ", gives a behind-the-scenes look at the rap icons' murder investigations. Two decades since the tragic deaths of Tupac Shakur and The Notorious B.I.G., biographical stories of the 1990s era hip-hop icons continue to resonate in today’s zeitgeist, due to a number of notable film and television projects. However, the latest series delves into the behind-the-scenes aspect of their murder investigations. “Unsolved: The Murders of Tupac and The Notorious B.I.G.”, is a 10-part true crime series kicking off Feb. 27 on the USA Network, a program service of NBCUniversal Cable Entertainment that is a division of NBCUniversal. Helmed by Emmy Award-winner Anthony Hemingway, the new project offers more insight into the cases by specifically chronicling the police investigations of the controversial murders. “I got excited about this project because I think it will help to continue to elevate us because there are things that we can draw from it that will help improve us and better pull us together,” Hemingway told NBCBLK. 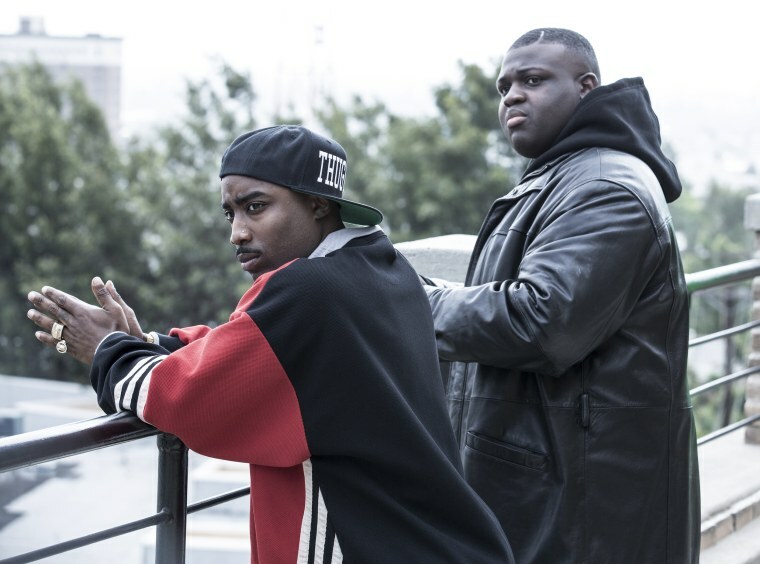 Featuring actors Marcc Rose, who plays Shakur and Wavvy Jonez, as Christopher 'Biggie Smalls' Wallace, “Unsolved” also stars veterans Josh Duhamel, Jimmi Simpson, and Bokeem Woodbine as Los Angeles detectives Greg Kading, Russell Poole and Daryn Dupree. Kading, who is an executive producer of the series, authored the bombshell 2011 tome “Murder Rap: The Untold Story of the Biggie Smalls & Tupac Shakur Murder Investigations,” in which he implicated rap moguls Sean “Puff Daddy” Combs and Suge Knight. The former LAPD detective was a source of inspiration for the series, which was shot in Los Angeles over the course of four months in 2017. With numerous credits including “The Wire,” “Power” and “Empire” to his credit, Hemingway knows his way around contemporary fare. But his directing of the 2012 George Lucas-produced World War II epic “Red Tails” and the widely watched WGN America slave narrative series “Underground” showcased his interest for period drama. In 2016, the sought after director hit a career high with “American Crime Story: The People v. O.J. Simpson,’ in which he won a Primetime Emmy Award for outstanding limited series. The Bronx native is well aware of the relationship shared between the racially charged murder trial of the former football superstar and the unsolved murders of the hip-hop kingpins. “The interesting thing here is, from the starting place, it was almost like “Unsolved” was turning the page almost as a Stan Craig book does, because this story really was on the heels of the O.J. trial and The Rampart Scandal and all that stuff,” he reflected. Hemingway’s latest work fits well into a diverse and growing career trajectory that has run the gamut from medical drama “ER”, sci-fi with “Battlestar Galactica”, “American Horror Story” and others. “I'll say it this way, I like stories full of commas, question marks, and periods but every once in a while we get an exclamation point. This has been one of those exclamation points for me. And what it means, I feel, the contribution it adds to that body of work,” Hemingway said. “Unsolved: The Murders of Tupac and The Notorious B.I.G.” premieres Tuesday, Feb. 27 at 10 p.m. ET.